Behavior-driven development using Python's 'behave' framework can help your team achieve better collaboration and test automation. Have you heard about behavior-driven development (BDD) and wondered what all the buzz is about? Maybe you've caught team members talking in "gherkin" and felt left out of the conversation. Or perhaps you're a Pythonista looking for a better way to test your code. Whatever the circumstance, learning about BDD can help you and your team achieve better collaboration and test automation, and Python's behave framework is a great place to start. Defining a product's features based on its behaviors makes it easier to describe them, develop them, and test them. This is the heart of BDD: making behaviors the focal point of software development. Behaviors are defined early in development using a specification by example language. One of the most common behavior spec languages is Gherkin, the Given-When-Then scenario format from the Cucumber project. Behavior specs are basically plain-language descriptions of how a behavior works, with a little bit of formal structure for consistency and focus. Test frameworks can easily automate these behavior specs by "gluing" step texts to code implementations. When the user searches for "panda"
Then results are shown for "panda"
At a quick glance, the behavior is intuitive to understand. Except for a few keywords, the language is freeform. The scenario is concise yet meaningful. A real-world example illustrates the behavior. Steps declaratively indicate what should happen—without getting bogged down in the details of how. The main benefits of BDD are good collaboration and automation. Everyone can contribute to behavior development, not just programmers. Expected behaviors are defined and understood from the beginning of the process. Tests can be automated together with the features they cover. Each test covers a singular, unique behavior in order to avoid duplication. And, finally, existing steps can be reused by new behavior specs, creating a snowball effect. Each step is "glued" by decorator to a Python function when behave runs tests. The behavior-driven-Python project on GitHub contains the examples used in this article. So that I don’t drop them all. Both the Feature and Scenario sections have short, descriptive titles. The lines immediately following the Feature title are comments ignored by behave. It is a good practice to put the user story there. Scenarios and Features can have tags (notice the @cucumber-basket mark) for hooks and filtering (explained below). Steps follow a strict Given-When-Then order. Additional steps can be added for any type using And and But. Steps can be parametrized with inputs—notice the values in double quotes. Scenario Outlines always have an Examples table, in which the first row gives column titles and each subsequent row gives an input combo. The row values are substituted wherever a column title appears in a step surrounded by angle brackets. In the example above, the scenario will be run three times because there are three rows of input combos. Scenario Outlines are a great way to avoid duplicate scenarios. There are other elements of the Gherkin language, but these are the main mechanics. To learn more, read the Automation Panda articles Gherkin by Example and Writing Good Gherkin. Every Gherkin step must be "glued" to a step definition, a Python function that provides the implementation. Each function has a step type decorator with the matching string. It also receives a shared context and any step parameters. Feature files must be placed in a directory named features/, while step definition modules must be placed in a directory named features/steps/. 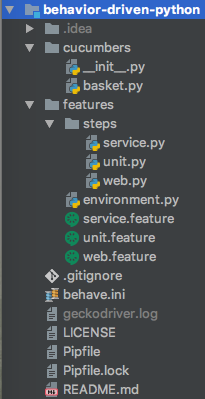 Any feature file can use step definitions from any module—they do not need to have the same names. Below is an example Python module with step definitions for the cucumber basket features. Three step matchers are available: parse, cfparse, and re. The default and simplest marcher is parse, which is shown in the example above. Notice how parametrized values are parsed and passed into the functions as input arguments. A common best practice is to put double quotes around parameters in steps. Each step definition function also receives a context variable that holds data specific to the current scenario being run, such as feature, scenario, and tags fields. Custom fields may be added, too, to share data between steps. Always use context to share data—never use global variables! behave also supports hooks to handle automation concerns outside of Gherkin steps. A hook is a function that will be run before or after a step, scenario, feature, or whole test suite. Hooks are reminiscent of aspect-oriented programming. They should be placed in a special environment.py file under the features/ directory. Hook functions can check the current scenario's tags, as well, so logic can be selectively applied. The example below shows how to use hooks to set up and tear down a Selenium WebDriver instance for any scenario tagged as @web. Note: Setup and cleanup can also be done with fixtures in behave. Any Python packages and custom modules can be used with behave. Use good design patterns to build a scalable test automation solution. Step definition code should be concise. To run tests from the command line, change to the project's root directory and run the behave command. Use the –help option to see all available options. For convenience, options may be saved in config files. pytest-bdd, a plugin for pytest. Like behave, it uses Gherkin feature files and step definition modules, but it also leverages all the features and plugins of pytest. For example, it can run Gherkin scenarios in parallel using pytest-xdist. BDD and non-BDD tests can also be executed together with the same filters. pytest-bdd also offers a more flexible directory layout. radish is a "Gherkin-plus" framework—it adds Scenario Loops and Preconditions to the standard Gherkin language, which makes it more friendly to programmers. It also offers rich command line options like behave. lettuce is an older BDD framework very similar to behave, with minor differences in framework mechanics. However, GitHub shows little recent activity in the project (as of May 2018). Any of these frameworks would be good choices. Also, remember that Python test frameworks can be used for any black box testing, even for non-Python products! BDD frameworks are great for web and service testing because their tests are declarative, and Python is a great language for test automation. This article is based on the author's PyCon Cleveland 2018 talk, Behavior-Driven Python.